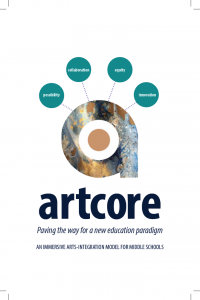 ArtCore is an evolving model for arts-based school enhancement that unites community based teaching artists with middle school educators to generate creative, challenging and sustainable learning opportunities for historically marginalized students. Teaching artists work side by side with one grade level of educators per year during three years, modeling arts integration approaches across the school. This collaboration cultivates skilled cohorts of students and renews a strong school culture that values the unique creativity of every student and educator. By engaging every member of the school community as a learner, ArtCore goes to the heart of integrative, imaginative and culturally responsive learning. ArtCore is a partnership between the Educational Policy Improvement Center, Lane Arts Council and five Lane County, Oregon middle schools. The five current ArtCore teaching artists (“Weavers”) have backgrounds ranging from ceramics to theater and printmaking to recycled sculpture.